Explore 35 centuries of glass art and scholarship with over 200,000 glass collection objects and items from the Rakow Research Library available in the integrated Glass Collection and Library Collection Databases. Search, save and keep notes in your own Collection Sets. Also, explore themed tours created by the Museum. Login to create a Collection Set. 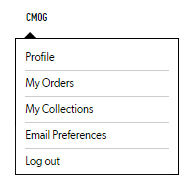 In order to save objects to your Collection Set, you must be a registered user on cmog.org. To become a registered user, click “Login” above the search bar at the top right of the page. After you register, you will be able to Login and begin creating your own Collection Sets. Like an object in the Glass Collection? You can save an object to your Collection Set by clicking “Save To My Collection +” on the collection object record page. 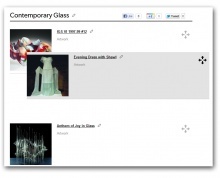 Your Collection Set can also include events, exhibitions, articles, audio, video, or any page with the “Save To My Collection” link on cmog.org. Clicking the "Save To My Collection" link displays a list of your Collection Sets. 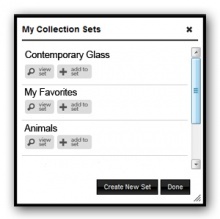 From here, you can click to "Create New Set," or add the object to an existing Collection Set. You can create multiple Collection Sets. Click "add to set" to add the object to as many sets as you would like. When you are finished, click "Done." Click and drag an object to rearrange the order of your Collection Set. Click the pencil icon to edit objects in your Collection Set. 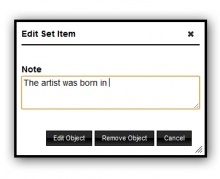 Add a note and click "Edit Object" to save. Click "Remove Object" to delete the object from your Set.